Thank you for visiting the Complete Lawn Service website. Complete Lawn is your number one source for dependable Arlington lawn service. We are a family owned and operated company that has been creating beautiful outdoor spaces for Northern Virginia residents and businesses for over 35 years. We have a staff of trained professionals that use the finest quality materials to meet your lawn care and landscaping needs. 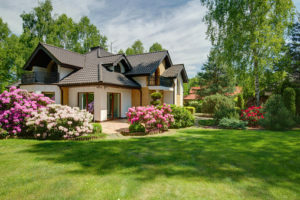 Lawn Care – We provide mowing services that include premium small mower service, seeding and feeding with insect control, and shrub and bed care that includes tree/shrub trimming and plant care. Landscaping – Complete Lawn can design and install a beautiful combination of a lush green lawn and healthy plants, design and install a hardscape with patios, walkways and retaining walls, and provide drainage solutions to prevent flooding and erosion. Irrigation – Our Certified Irrigation Designer can design a full functional, water-efficient sprinkler system for your space, using state-of-the-art components. We also take care of sprinkler system maintenance, repairs and upgrades. Mosquito Control – We use people, pet and environmentally-friendly natural oils to spray your property and keep mosquitoes away. Snow Removal – If your business or residence is buried in the snow, call us…we’ll send our crew with plows and shovels to get you back into the outside world again. When you’re searching for dependable Arlington lawn service, the team at Complete Lawn is ready to meet all of your lawn care needs. Our professionals will work with you and your individual needs to create an outdoor space that you’ll love. If you’d like a complimentary landscape consultation, give us a call today or click on “Get A Price” to fill out the online request on this website. We’re looking forward to being your go-to company for dependable Arlington lawn service.